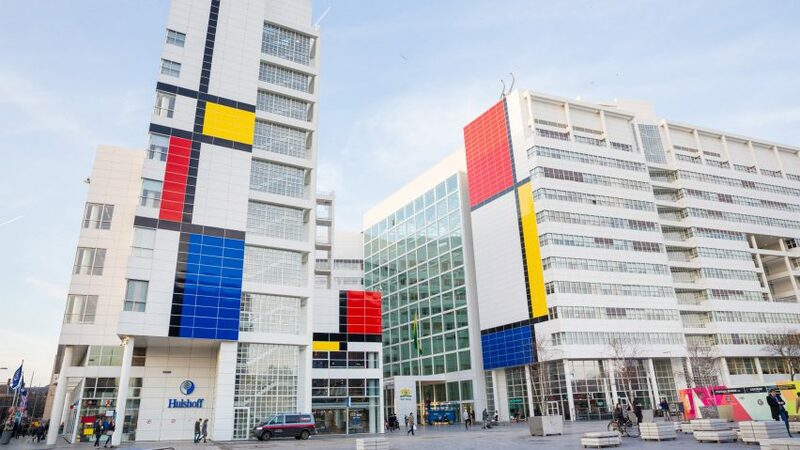 Richard Meier's City Hall in The Hague has been painted in the style of Piet Mondrian, to mark the 100th anniversary of the De Stijl movement. The usually white facades of Meier's City Hall building – the American architect's only project in the Netherlands – provided the perfect canvas for the blocks of red, blue and yellow and black lines. The paintwork will cover the building for one year to celebrate the 100 years since Theo van Doesburg founded Dutch art movement De Stijl, also known as neoplasticism. Piet Mondrian, who died aged 71 in 1944, was a principle member of the group of artists and architects that created abstract work based on a strict geometry of horizontals and verticals, and bold colours. The makeover of the city hall is the first in a series of installations that will take place across The Hague – which holds the world's largest collection of Mondrian's works – in 2017. At 82, Meier is one of America's most respected architects and one of the last of the 20th-century modernists still practicing. He started working on the city hall in 1986, two years after he was awarded the Pritzker Prize. The building includes council chambers, offices, public library, retail, and a white exhibition space. Meier is renowned for his white buildings – such as the seminal Getty Center, completed in Los Angeles in 1997. Today, the buildings designed by his firm follow the same style – predominantly white and glassy, with formal, gridded facades. Last year, the architect came 96 in Dezeen's Hot List ranking, a guide to the most newsworthy and searched-for players in the design world in 2016. In an exclusive interview, Meier spoke to Dezeen about the New York skyline and revealed he would consider working for US president Donald Trump.